I've never heard anyone brag about what they spend for a medical procedure. Healthcare isn't like housing or transportation. People are proud to shell out big bucks for a big house, and many drivers can't wait to show off their expensive set of wheels. But when it comes to healthcare, we're only smiling when we save money, not spend it, which makes the current trend so much more difficult. While government officials point to slower price increases and bray on about bending the healthcare cost curve, everyday people are watching more of their hard-earned dollars fly out the door to pay for care. Even though overall costs might be rising at a slower pace, the amount consumers have to pay is shooting to the moon. And the pain doesn't stop at the door to retirement. As the healthcare monster devours more dollars, we have less money to spend where we want, which adds to the misery in our economy, and will eventually add to a nasty financial setback. Middle-income households now spend more on healthcare than any other cost outside of shelter. This part of their budget jumped more than 3% from 1984 to 2014, and now eats up 8.9% of their funds. Most of the increase occurred in the last 10 years, as healthcare spending rose 25% from 2007 to 2014. As these families spent more on doctors and prescriptions, they spent less on food, housing, clothing, and transportation. Keep in mind that this calculation ends just as the ironically named Affordable Care Act went into action. Since 2014 things have gotten much worse, not better. 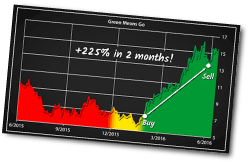 Over the last four years, this small but powerful window of opportunity has delivered gains as high as 116%, 124%, 140%, 191%, 201%, 316% and 336%... ALL in less than 90 days! Click here now to read more on how Adam's been crushing the S&P for the last five years and how you can get his next GO signal immediately. Consumers who purchase insurance on the healthcare exchanges know about rising prices all too well. Premiums have increased by double digits every year for most buyers, and in 2017 prices will shoot higher by almost 30%. In just a few short years, premium prices are up 50%, and that's just for the privilege of buying insurance. Sure, there are subsidies out there for almost 90% of buyers, but that covers just the premium cost. Once you have insurance, there's the small matter of the deductible. Insurers have reconfigured policies to include higher deductibles to keep premium prices lower than they would have been. That's nice in theory, but with premiums up by double digits each year, tacking several thousand dollars onto the deductible just adds insult to injury. Deductibles of $5,000 and $6,850, on top of $1,000-per-month premiums, are common. This is also where workers who get their insurance through their employers are feeling the heat. Firms still pay roughly 80% of insurance premiums for employees, but the plans are less generous, requiring more deductible payments. The effect, while not as pronounced, is the same. Consumers have less cash to spend on what they want. For retirees, the math gets more complicated. The government deducts Medicare Part B payments from Social Security checks. This year, the price of Medicare Part B is expected to climb more than 20%, or about $27 per month. But inflation has remained tame, so the Social Security Cost-of-Living Adjustment (COLA) could be as small as 0.2%, or even flat. For those receiving the average benefit of $1,335 per month, this equates to less than $3 per month. The increase in Medicare Part B will eat up all of that gain and then some. Recent retirees might get some relief. If they earn less than average income, then the Hold Harmless Act would shield those who retired in the last year from a Medicare cost increase that would reduce their benefits below the prior year's level. Unfortunately, this only works once, and then the recipients must eat the cost. The price of Medicare Part B jumped 16.1% last year, so those who were able to avoid that price hike now have to pony up. To make it even more of a puzzle, if the COLA ends up at 0%, then the Hold Harmless Act doesn't apply, and all Social Security recipients will get hit with the full cost increase, thereby lowering their incomes. The end result is that most everyone in America is paying significantly more for healthcare, either through premiums, deductibles, or a combination of the two. This leaves us with less money to spend on what we want. It's harder for young families to afford having children or buying homes, while retirees can't spend as much on maintaining their lifestyles. For those in the middle, saving for retirement and education is difficult. The problem with healthcare is that it doesn't fade with an economic downturn. When our economy resets and financial assets drop, healthcare costs will remain high, eating up more of our falling incomes, and creating a further drag on the economy. The premium subsidies for the health exchanges, and the makeup payments for the Hold Harmless Act, come from somewhere. Or, more to the point, from someone. That lucky person is the U.S. taxpayer, who is on the hook for ever-rising healthcare costs as the government declares bigger sections of the population eligible for assistance. As equity markets reach new highs and consumer misery plumbs new depths, something's got to give. Don't be left holding the bag when the markets roll over. Make sure you have enough left in your pocket to pay for your premiums… and your deductible. Love him or hate him, President Obama made one of the best stock market calls… ever! On March 3, 2009 he said, "Buying stocks is a potentially good deal." Just three days later – on March 6 – the S&P 500 bottomed out and has since marched 217% higher. In hindsight, we know his timing was nothing short of incredible! But buying at the bottom – in real-time (and with real money) – is incredibly difficult to do. Very few investors have the emotional fortitude to buy aggressively when there's blood in the streets and a call for Armageddon in the news cycle. And if you call the bottom too early, you're toast! That said, bear markets are incredible opportunities... if you have a proven strategy that tells you exactly when it's time to buy. Well, that's exactly what my Cycle 9 Alert strategy is designed to do. My Cycle 9 Alert approach plays sector-specific trends because, as I like to say, "There's always a bull market somewhere." By the same token, "there's always a bear market somewhere," too. And while you've probably been told that the market is either bullish or bearish – with no in-between – you're limiting your profit opportunities if you're stuck thinking of it that way. Take the healthcare sector, for instance. Does Social Security Owe You an Extra $10,224 This Year? Did you know that roughly $25 billion in Social Security benefits goes unclaimed each and every year? In fact, Americans who filed their Social Security incorrectly may have "missed out" on more than $120,000 in unclaimed benefits last year. I just put together a presentation to show you how you can collect the Social Security owed to you. The pharmaceuticals sector (XPH) lost a full 43% between September and March. And the closely related biotech sector (XBI) lost 50% in even less time! Meanwhile, in April, the S&P 500 was sitting just 2% below its all-time high. Now, I fully realize it seems odd for entire sectors and industry groups to go through full-blown bear markets while, at the same time, the major stock indices are hitting new highs. But this is actually fairly common. For various reasons, individual sectors can go through periods of dramatic underperformance. We've seen this recently in the energy sector. And before that, a bear market in the metals sector led my Cycle 9 Alert system to a hugely profitable opportunity. Earlier this year, in January, metal-mining stocks were down a whopping 73% from their highs and nobody wanted to touch these stocks with a 10-foot pole. But in February, my Cycle 9 Alert system triggered a buy signal on a left-for-dead silver miner from Canada – Pan American Silver Corp. I recommended the trade to my subscribers and two months later we walked away with a cool 225% profit! Now, this may seem like an unusual result. But in fact, my research shows that some of the very best rally opportunities come from sectors that are crawling their way out of bear market territory. In fact, the profit-per-trade of these bear market opportunities is three-times stronger! These opportunities don't come about every day. They're certainly rarer than bull market opportunities (since stocks tend to spend more time rising than falling). But if you're patient, sector-specific bear market opportunities come about often enough to make some serious coin! Like the 225% I helped Cycle 9 Alert readers make between February and April this year, on Pan American Silver Corp.
And like the 100%-plus profits I'm targeting on our most recent sector-specific bear market opportunity… in a beaten-down niche of the healthcare sector. For obvious reasons, I can't divulge the full details of this trade (released just last week). But the investment I recommended is still trading within my suggested buy range, so there's still time to get in. You can access my Cycle 9 Alert system – and this particular trade – by clicking here. In short, my research shows that you shouldn't discount bear market buying opportunities. And you should stop looking at the market as one giant blob of (over-priced?) stocks. With my sector-specific Cycle 9 Alert approach, there's always an opportunity somewhere. Good for who? Not the consumers.....why did they not get asked that question? For the first time, support for the Common Core educational standards no longer outdoes opposition. According to the 2016 Education Next poll released Tuesday, among those who take a stand on the issue, 50 percent of the general public supports Common Core, with 50 percent opposed. After two weeks of devastating flooding in Louisiana that left at least 13 people dead and thousands homeless, residents are starting the arduous task of cleaning up and rebuilding. President Barack Obama joined the fray on Tuesday, making a visit to some of the hardest hit areas of East Baton Rouge Parish and promising government aid to those affected by the historic flood. The flooding in Louisiana has been nothing short of tragic. The loss of life, the people displaced, and the damages that have permanently altered the lives of the people of Louisiana in the “worst disaster since Sandy” requires a response from Congress that is measured and fiscally responsible. There are either dozens of federal agencies or hundreds, depending, seemingly, upon the day of the week or whom one asks. The Federal Communications Commission (FCC ) is not the top dog among regulatory bureaucracies by the number of rules issued–but it’s a contender going by influence. It is easy to forget that bad policy ideas aren't limited to one particular political party. Recently, Hillary Clinton proposed $275 billion in infrastructure spending over five years and $225 billion in loan programs through a national infrastructure bank. Not one to be outdone, Donald Trump pledged to double Clinton's proposed spending, saying in an interview with Fox Business, "We need much more money to rebuild our infrastructure." The health-insurance giant Aetna has announced it will exit 11 of the 15 health-insurance exchanges where it sells Obamacare plans. Aetna’s announcement comes on the heels of news that UnitedHealthcare, Humana, Blue Cross and Blue Shield of New Mexico, Blue Cross and Blue Shield of Minnesota, and Texas’ Scott and White Health Plan, and 70% of Obamacare’s failed Co-Ops, and other insurers will exit many or all of the exchanges for which they had previously shown such enthusiasm. In a landmark 1984 decision known as Chevron U.S.A., Inc. v. Natural Resources Defense Council, the U.S. Supreme Court held that when the federal courts are confronted with an "ambiguous" statute, the default position is for federal judges to defer to the statutory interpretation favored by the federal agency charged with enforcing that statute. "Federal judges—who have no constituency—have a duty to respect legitimate policy choices made by those who do," declared the majority opinion of Justice John Paul Stevens. "While agencies are not directly accountable to the people, the Chief Executive is, and it is entirely appropriate for this political branch of the Government to make such policy choices." In other words, Chevron instructs the courts to tip the scales of justice in favor of federal agencies in cases dealing with questionably worded federal statutes. Lawyers call this approach "Chevron deference." I've been working behind the scenes to ensure this year's Irrational Economic Summit is the go-to financial event of the year. This week I secured two more highly visible, keynote-worthy guests to join our speaker line-up this October 20-22. We now also have Howard Lindzon, legendary angel investor, entrepreneur and provocateur – not to mention the guy behind Stocktwits! – who will discuss "How Markets in Turmoil are Opportunities"… he'll even tell you the top fintech companies to consider for your portfolio. George Gilder (who was a hit at our 2013 summit)! George's newest book and topic of his presentation – The Scandal of Money: Why Wall Street Recovers but the Economy Never Does – couldn't be more fitting for our event. His presentation in 2013 was one of the only times in my 18 years in this business that I've seen anyone get a 10-minute standing ovation from all 400 people in attendance. Of course, we're excited for you to meet and hear from all of our speakers this October, but we're especially pleased that Howard and George have agreed to join us. So, if you haven't yet reserved your seat at our Irrational Economic Summit, do so now. These guys are a must-see and must-meet! On Monday, August 22, Harry wrote to 5 Day Forecast readers about the perverts who have hijacked the economy, how stocks or gold won't save you, and what you can do to improve your investment successes. Some people didn't like Harry using bad language. That's unfortunate because if you've ever met Harry or heard him speak, you know that he is a very passionate, outspoken man. To censor Harry for the sake of a few sensitive souls would do you a disservice. With all due-respect, we'd prefer you hear it like it is, or you may as well just be reading The Wall Street Journal. Later that day, Harry broached another super-sensitive topic: the election. In the Economy & Markets email to you, he warned that if Trump loses the election come November – which looks likely at this point – we could be facing civil war. That's because Trump's movement is born out of a deep dissatisfaction among the middle and lower classes in this country. Their standard of living has gone nowhere since the early 1970s, and has actually gone down since 2000 when you adjust for inflation. You've got to read this article if you missed it on Monday. On Tuesday, August 23, Adam wrote to his Cycle 9 Alert subscribers about the opportunities he sees in the healthcare sector. Having recently instructed Boom & Bust subscribers to bank profits on an investment that Adam's algorithm alerted us to two years ago, we're also about to add a healthcare play to our model portfolio. It seems there are some fantastic hotspots in the sector, as well as some very dangerous spots you're going to want to avoid. Adam will share some more details with you on Monday, so don't miss it. On Wednesday, August 24, Rodney expressed to his Triple Play Strategy subscribers the frustration we're all feeling right now at being back on the Fed-watching hamster wheel. Central bankers from around the world met in Jackson Hole this week, and investors hung on every word. As Rodney wrote: "Why, we don't know. Bankers have been wrong about, well, everything, and yet they keep pursuing failed strategies and telling us how wonderful things will be at some point in the future. Unfortunately, the future is now, and we don't have economic growth. Instead, we have several asset bubbles on the verge of bursting." And that afternoon Lance, Editor of Treasury Profits Accelerator, wrote to you about how you can make the best trade ever. Over. And Over. And Over. He made it seem so simple. You've got to give that article a read. On Thursday, August 25, John instructed his Forensic Investor subscribers to sell-short a household name… again! Last week, we reached stock market insanity. [The targeted company] reported earnings for its third quarter and while they topped estimates, they included some one-time items and a lot of massaging of the numbers. On the top-line, revenue fell short of expectations by about $200 million, and guidance was revised to include equipment sales falling 10% for the year versus previous expectations of 9%. Yet, somehow, the stock rallied over 13% on the news. It seems Wall Street was willing to overlook a terrible quarter… because the outlook for future quarters was improved due to major cost cutting. So, basically the business is melting away but earnings will improve by cutting costs and lowering the effective tax rate. Great way to play defense! And on Friday, August 26, Harry showed you evidence that the global real estate bubble is officially bursting. Singapore real estate has declined 21.5% over the last few years and Vancouver real estate is down 24% in just five months! The question now is… who's next? Read the article here to see what Harry thinks. We're also finishing up the September issue of Boom & Bust, which we'll be emailing to subscribers on Monday. The print edition will arrive in mail boxes across the country in a week or two. In this latest issue, Harry gives his subscribers an exclusive preview of the Bubble Model he has developed. It's crazy accurate. Definitely something you're going to want to see. So watch out for your latest issue. If you're not yet a subscriber, but would like to give a risk-free trial subscription a go, simply fill out this form. That wraps it up for this week. Obamacare was supposed to save the American economy. Four-year old insurance startup Oscar Insurance Corp. announced Tuesday it plans to pull out of two Obamacare marketplaces in the wake of massive losses largely attributed to Affordable Care Act plans. The insurer is slated to leave markets in Dallas, an area they entered just this year, and New Jersey next year. Remember when Obamacare's health insurance exchanges were supposed to work like buying a TV on Amazon? The annual Education Next poll shows that public support for the Common Core State Standards has fallen to a record low. According to the survey, support for the Common Core education plan dropped to 50 percent this year, down from 58 percent in 2015 and from 83 percent in 2013. With voter approval rates for Hillary Clinton averaging a negative 10.9 percentage points and those for Donald Trump at a negative 28.6 percentage points, it's conceivable that their vice presidential choices will tip the scales for undecided voters in November. The press and commentators analyzing both parties (except for some die-hard Bernard Sanders acolytes) generally agree that popular Sen. Tim Kaine of Virginia is Democratic nominee Hillary Clinton's ideal running mate - a well-mannered, modulated moderate from a key swing state. The press and political sages have called Mike Pence the perfect ticket mate for Mr. Trump because he has stood firmly on the right in the U.S. House and in his current role as Indiana governor. Vice-presidential candidates are chosen for political reasons. It's called "balancing the ticket." Sen. Tim Caine fully matches Hillary Clinton's extreme liberalism and the Democrat platform. Gov. Mike Pence, a conservative evangelical, reflects the Republican platform. Pray that values voters will examine both party platforms and consider voting pro-life. The platform contrasts could not be more stark. Three months after the U.S. Supreme Court ordered both sides to seek out a compromise on Obamacare's birth control mandate, religious nonprofits that oppose it are mobilizing to win the fight, while the administration is saying it's ready to tweak the rules. The Health and Human Services Department has asked the public to weigh in through next month on ways to ensure women get access to contraceptives including the morning-after pill and accommodate faith-based schools, hospitals and charities that refuse to pay for something they consider sinful. This is "the problem that will not go away." Pray for Father Frank Pavone of Priests for Life and all those who are standing fast against government opposition to sacrosanct religious convictions. Such convictions will not allow them to dispense contraceptive materials. The administration is determined to overcome. Pray for clear-cut victory, that religious freedoms will prevail. There's something about deploying the government as a mugger to obtain the fruits of someone else's labor that appeals to the worst in us. But it invariably leads to poverty, dishonesty and even tyranny. Years ago, I visited Jamaica when it was under a socialist government. Things had deteriorated. Trying to fool the people, the government ordered imported goods to be repackaged as locally produced. This is a good warning article. Let us "watch and pray." But we also acknowledge that America is close to succumbing to out-and-out socialism, if not communism, where the state rules and our U.S. Constitution is all but obliterated. This is not pessimism, but a call to much prayer. We urge all readers to study the political issues and platforms, then vote for the values you believe. Hillary Clinton will have to give testimony about her secret email server and account, but it will be in writing rather than in person, a federal judge ruled Friday, delivering a partial victory to the Democratic presidential candidate. Mrs. Clinton will have until the middle of November - after the election - to answer those questions, Judge Emmet G. Sullivan ruled. But the State Department must quickly process and release any of the emails the FBI has recovered from Mrs. Clinton's accounts that are sought in the open-records lawsuit filed by Judicial Watch. Judge Sullivan said those must be released by Sept. 30. Please pray fervently for our nation. We ask each reader to work with your church, your prayer group, and with us to "Get Out the Prayer." America's major issue is not Mrs. Clinton or her email reporting practices. Our country's challenges are first spiritual. Mrs. Clinton's truth issues are a symptom not a cause. Pray for national spiritual renewal and revival in the Church. Growing up, I watched a lot of Westerns. In addition to the cowboy hero, the town sheriff was almost always a model of integrity. He stood for law and order against bank robbers, cattle rustlers and horse thieves all trying to disrupt the peace. A contemporary and real-life version of those fictional characters is Sheriff David Clarke of Milwaukee County, Wis.
Sheriff Clarke has been trying to restore law and order after several nights of rioting following the shooting death of 23-year-old Sylville Smith by a Milwaukee police officer. Smith had a lengthy criminal record, longer than some people's resumes. He should have been in prison.